Cable Markers Company thermal transfer labeling systems provide extra-sharp printing and high density bar codes. We provide several types of thermal transfer labels in a range of sizes and materials for wire and component marking. There are typically two different styles of thermal transfer printable labels. 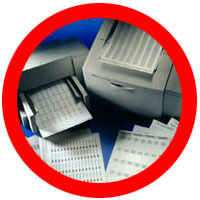 (Blank and Self-Laminating) Our blank labels can be used anywhere from computer circuit boards to component marking. 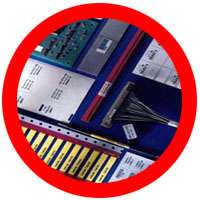 Our self-laminating labels are used for marking wire and cable. The clear overlap protects printed information. We also offers printing systems, software and ribbon to get you started! Laser Tags are durable, laser printable labels for application requiring clear, crisp legibility, including bar coding. The labels come on 8.5" x 11" sheets and are printable using either Tagprint Pro 3.0 labeling software and a standard laser printer. Specially designed adhesives and materials are used for Laser Tags, ensuring the labels will not curl, change color or jam laser printers. Available in self laminating and blank styles, Cable Markers Laser Tags accommodate a wide variety of labeling applications including wire and component marking. 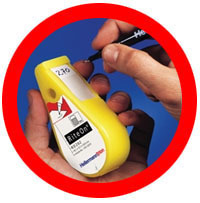 Rite-On Markers are made from a flexible vinyl film and are used to mark wire and cable. The selflaminating labels have a clear tail which seals the legend under clear vinyl, maintaining the quality of the labels. The Rite- On markers are packaged in a reuseable dispenser made from high impact plastic which is resistant to oils and grease. • Easily and conveniently fits in a pants or shirt pocket. • Once loaded, unit allows minimal label exposure to dust and moisture. • Can be used with standard ball point pens or permanent marking pens. • Excess liner is easily cut-off by tearing it over the edge guide at the front of the unit. • The dispenser can be reloaded over and over again, making it a cost-effective and efficient method of labeling. Ordering heat shrinkable wire markers has never been easier and more cost effective. Why buy expensive printing equipment to make wire markers, when you can order them from us today, and have them tomorrow? Cable Markers Company has been in the wire marker business since 1960. We've pioneered many of the processes used in our industry today. Depending on your job requirements, we will either produce hot stamped or thermal transfer printed shrink markers. Both meet Mil-Spec standard MIL-M-81531 (SAEAS81531) for mark permanence. 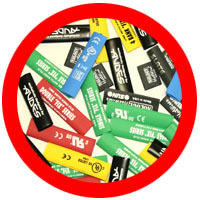 Your products are important to you, so order your shrink markers from the identification experts! The Advanced Wire Marking System produces sleeves and tags for the easy identification of electrical wire, cable, and mechanical tubing of all types. 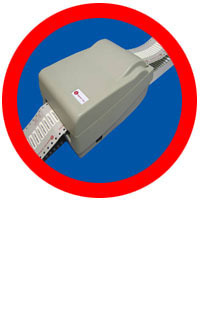 These sleeves and tags are not only permanent, but they are also economical to generate in-house on an asneeded basis. The products are manufactured from cross-linked polyolefin, a flame retardant material that will tolerate exposure to temperatures up to 135°C. The sleeves conform to AMS-DTL 23053/5, Class 1 & 3 for material and functional requirements. The tags conform to AMS-DTL 23053/6, Class 1 for material and functional requirements. Furthermore, they are resistant to common fluids, lubricants and solvents. Once printed, the sleeves and tags are ready for installation without any additional treatment. ShrinkTrak™ heat shrinkable wire markers make it easy to mark wire, cable, and other components. These ladder-style markers are designed with side slits for easier application. All ShrinkTrak™ markers are military specified. They also reduce printer jams with their efficient and high performance design. For seamless labeling, ShrinkTrak™ can be printed using Tagprint Pro 3.0 professional label creation software along with our line of thermal transfer printers and ribbons. Create a permanent, solvent resistant print when shrunk and applied. Handi-Cards are easy release markers on a plastic card. They feature a strong adhesive which assures a long lasting bond on wire. Permanent, pre-printed legends are available in solid or sequence order. 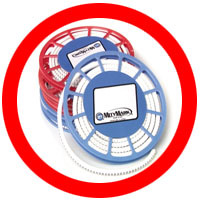 The MityMark™ compact Disk marker System features 500 PVC sleeve wire markers packaged on a convenient reel for ease of use. Each sleeve marker is 3mm in length with a single black stamped character on each marker. Each marker is chevron cut to assure proper positioning as multiple markers are applied. Standard marker color is white, with yellow available upon request. The MityMark Compact Disk Markers are available in two sizes to accommodate 16-10 wire gauge (.098 -.196 in.) and 22-16 (.051 - .118 in). The wire marker tape dispenser provides a convenient, economical system for wire marking. 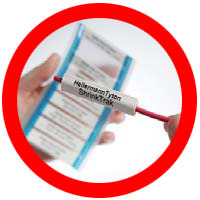 HellermannTyton’s wire marker tape features sharp, crisp legends which are coated to resist smearing and abrasion. 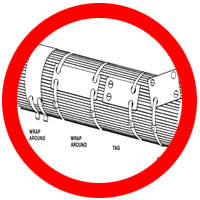 It is provided on a carrier strip to prevent contamination of the adhesive prior to installation, assuring permanent, non-flagging marker ends. 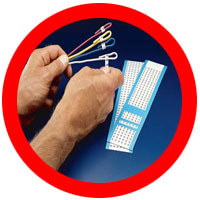 TipTags are non-adhesive, cross laminated polyolefin tags with die cut cable tie slots for mechanical fastening. 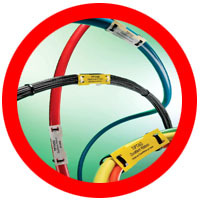 These cable markers are designed to mark wire bundles or large cables. TipTags are ideal for applications where exceptional print performance and long term service life are critical. TipTags consist of a thin, strong material which allows the tags to be lightweight, very strong and tear resistant. TipTags can be printed using Tagprint Pro 3.0 labeling software, and our line of thermal transfer printers.. Identification marker plates can be mounted in any direction, either vertically or horizontally as flags, tags, or wraparound identification plates. They can be marked with a permanent marking pen or hot stamped. 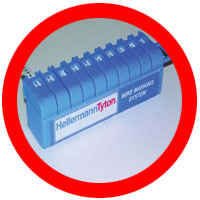 These marker plates are manufactured from nylon and are white. Use our standard cable ties to secure these marker plates just about anywhere. 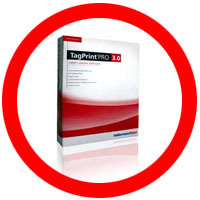 TagPrint Pro 3.0 label creation and printing software is powerful, multi-functional and extremely easy to use. Used to provide solutions for industrial identification, TagPrint speeds production and offers many options for a wide variety of labeling requirements. "What You See Is What You Get" label creation, bar coding, serialization, label sets, wire lists, graphics and text choices are just some capabilities of TagPrint software. TagPrint can be utilized with HellermannTyton's wide array of labeling options including Laser, Dot Matrix and Thermal Transfer printable labels.